My middle son just loves birds. He obsesses over them. He loves to watch them, feed them, draw them, and learn about them. But this time of year, it can be difficult to study them when they are outside in the cold -- and we are inside! 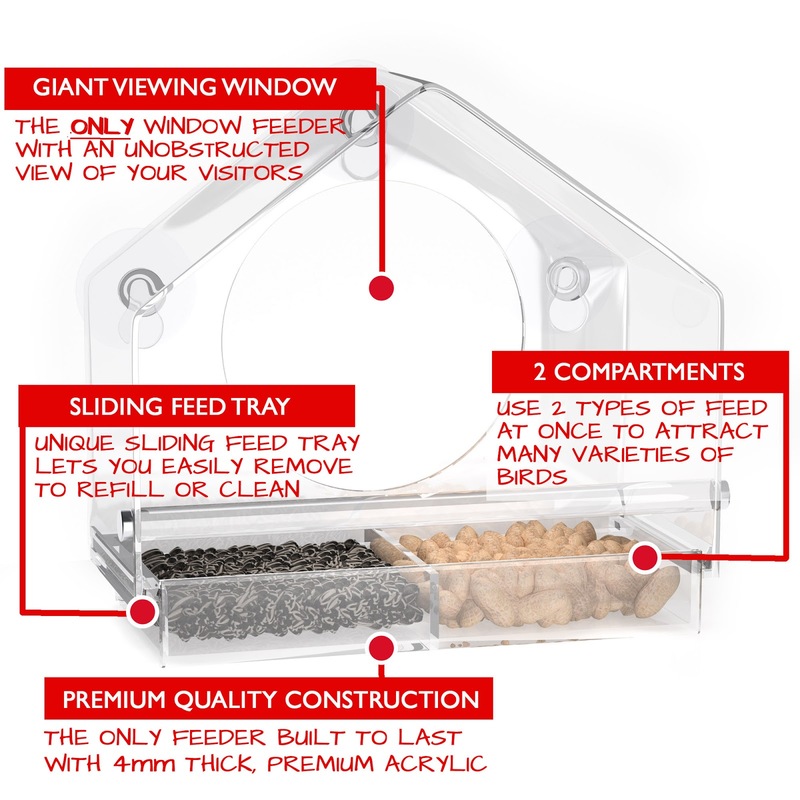 This season, we had the amazing opportunity to review a sample of the Birds-I-View Bird Feeder from Nature Anywhere. This is such an impressive way to watch and enjoy birds. 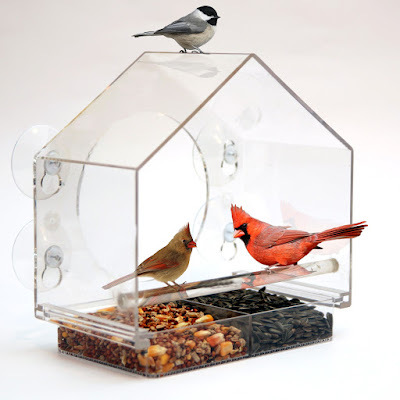 It is a completely see-through bird feeder, and it sticks easily to any window with its durable suction cups. I was expecting to receive something cheap or flimsy, but it came to us in a very solid, durably construction. The material that it is made out of is thick! Setting up the bird feeder is super simple. It sticks right onto your window, with no assembly required. But, I think the thing that impressed me most was how easy it was to refill. You can slide the feed tray right out of the bottom without having to take the feeder off the window. That means you can get fresh feed put in as often as you need it (which around here is almost daily). It makes it easy to clean, too! We have decided to make the large picture window in our family room the permanent home for this neat new way to enjoy birds. My kids are forever looking out the window anyway, but this time, instead of watching birds across the yard with binoculars, they can watch right from the window -- up close and personal! If you have nature lovers, bird enthusiasts, or just want a fun and personal way to learn about birds in your homeschool, this is a very neat addition to your family's collection of tools. With a lifetime guarantee, it's something your kids can enjoy for year and year to come! You can find the bird feeder for $29.90 at the Nature Anywhere website and at retailers across the U.S.
Wanna Win? We are giving one lucky Lille Punkin' reader their own Birds-I-View Bird Feeder! To be entered to win, just use the form below. Open to U.S. residents 18+ only. *Sample received to review. I was very impressed by this, and therefore all enthusiastic opinions are my own! I want to see Red Birds. They are so pretty. I hope to see little chickadees and Jenny Wrens. I want to see red birds, blue birds, and robins. I am hoping to see chickadees. I'd love to see cardinals. my brother-in-law really wants to get some yellow birds near the house! he already gets red ones and blue ones! I'd love to see doves, cardinals, and whatever the yellow and black birds are that I see from time to time near my house. Cardinals, and we also have a hawk that I would love to see closer! Would like to see some robins up close! We are moving in a year so I will just have to wait and see what kind of birds the feeder attracts year around. This sounds like fun, I've always wanted one of the window bird house things they show on t.v, but that's only 1 bird, this sounds much more interesting. I love to see cedar waxwings, cardinals, chickadees. I just love all birds. Heck I'd be thrilled to see a woodpecker. I would love to see a cardinal or blue jay! kristiedonelson(at)gmail(dot)com Thanks you. blue jays and cardinals are my favorite! I love the bright colors! In our area I'd hope to see bluejays and oriels! I'm hoping to see cardinals. I'd love to see some hummingbirds! They are adorable. I am hoping to see some woodpeckers. I would love to see a Blue Jay or Cardinal. :) I love all birds, though. I miss seeing red cardinals, but I've moved out of state. I'd love to see some bluebirds!! I like to see cardinals and blue jays! I am hoping to see the red cardinals we have around. I want to see a painted bunting. Cardinals! We have a few that hang out in our back yard each summer! Can't wait to see the first robins of spring! I would like to see more cardinals. They are beautiful! I would love to see some cardinals - they are so striking! I love watching cardinals and blue jays! Such pretty colors! we would love to see some cardinals! we have a variety of birds in our neighborhood that we would love to see. Red and blue birds are so pretty. I would love to see some cardinals, love their color against the winter snow. I want to see cardinals or maybe humming birds. I would love to see all different kinds of birds (except woodpeckers)--blue birds, cardinals, etc. I would love to see cardinals and bluebirds! I love watching all the birds here. Cardinals, robins, bluejays, orioles, woodpeckers, and many more. I love to see cardinals. I'd love to see sparrows and bluebirds.